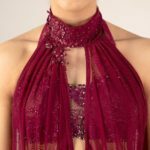 Home Tags Posts tagged with "rhinestones"
For a third season, Rhinestones Unlimited is proud to have sponsored the University of Minnesota Dance Team with another gorgeous costume. 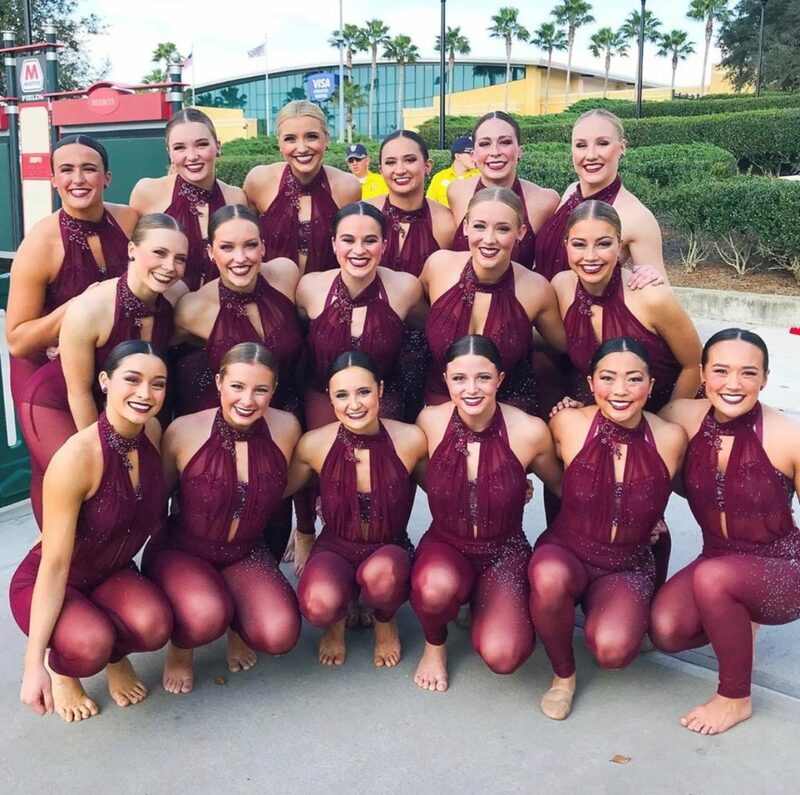 They represented their school and home state and took home a 19th national championship title in 20 years at the 2019 UDA Collegiate Nationals in Orlando. Preciosa crystals inspired this year’s Jazz costume, starring Rhinestones Unlimited EXCLUSIVE color Metallic Rose along with Burgundy, Burgundy AB and Amethyst Opal AB. This unique combination of Preciosa Viva 12 rhinestones feature uniquely cut facets and a large surface area that amplifies the light, magnifying the sparkle and enhancing their personality on the floor – perfect when your stage is an oversized arena. Moving beyond the skirted leotard look that’s swept the dance scene in recent years, costume designer Elle Bauer interpreted these elements into a strong, sporty, feminine silhouette perfect for the dynamic, athletic ladies who dance in it. Contrasting the soft neutral shades of years past, the 2019 piece is a rich merlot, complementing every dancers’ skin tone and echoing the U of MN’s school colors, maroon and gold. It begins with a solid high-waisted trunk and halter top that’s collared at the neck, where it meets two split swaths of chiffon that run down the front of the bodice to the waist, leaving an open back. The trunks continue where the chiffon left off, cloaked in attached sheer leggings that highlights the team’s signature movement choreographed by Mackenzie Larkin Symanietz and Amanda Gaines and of course those jaw-dropping à la seconde turns in perfect synchronization! The team previewed their Jazz routine when they hosted the annual fundraiser and showcase event, Best of the Best, which brings together some of the state’s best dance team in celebration of the sport. Rhinestones Unlimited teamed up with Matt Blewett and MN Dance News to bring you free downloadable images from the event for you to share on social media; https://mndancenews.com/2019/2019-best-of-the-best-dance-show/. Thank-you Matt for your continued support of MN Dance by reporting the news of our sport to the masses. Also, make sure you check out the gorgeous video work by Laura Sukowatey as she captured the costumes and movement of this talented team https://www.youtube.com/watch?v=r61NDYCSWOU. Congratulations, University of Minnesota Dance Team 2018-2019! We are all so proud of you! The largest world-wide wholesaler of Swarovski & Preciosa crystals for DANCE is right here in your home state! With four beautiful rhinestone brands for every budget, appliques, crystal trimmings and performance jewelry, Rhinestones Unlimited has everything you need to help your team stand out. Visit www.RhinestonesU.com, call 952.848.0133 or visit our Golden Valley showroom. We love to help our MN High School Dance Teams create one-of-a-kind costumes with maximum impact! © Deborah J. Nelson/Satin Stitches Ltd.
What rhinestones should I use? Should I set, sew, glue or ‘hot fix’ my rhinestones? What is a ‘hot fix’ rhinestone? What color and what size rhinestones should I use? What pattern should I use to trim my costume? How do I determine how many stones I will need? How do I know how long my project will take, and what if I do not have enough time? What if I do not know exactly how I want to stone my costume? How should we work on stoning a group of costumes? What if I can’t do it on my own? Rhinestones have only become more and more popular, with the Swarovski company creating more and more options for unique colors, with I assume, other lesser expensive rhinestone companies are following suit. My thoughts? Standard colors are less expensive than the various coated/specialty colors. Any time you add layers of colors or effects to a stone, there is an additional labor charge. Sure, these stones look lovely ‘up close and personal’ but from ‘performance distance’ do you really notice? ALWAYS make your money decisions for trim on the visual: are they noticeable from ‘performance distance’. The special effects cost may only be $2 more per gross, but when you end up with 100 gross being used, this expense escalates! 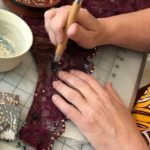 Satin Stitches has paired up with a local Minnesota company, as a source for the Swarovski rhinestones that we use. Rhinestones Unlimited is located in suburban Minneapolis, sells nationwide through their website. They include lots of information on their website, including a “Rhinestone Estimating Guide” which has visuals to show how many stones are involved in specific coverages. They calculate size #12 up to, and including size #34. Sometimes a picture IS worth a thousand words! At Satin Stitches, we STILL most always use Swarovski Hot Fix rhinestones. We still love that we can attach them ‘in the blink of an eye’ and they STAY ON! What more can you ask for? Don’t be intimidated when it is suggested to use a ‘hot fix tool’. You can, and we did, decades ago, but now we us a tweezers, a straight pin or a ‘pick me up’ tool – so much easier to work with than the official ‘hot fix tool’! When we cannot use ‘Hot Fix’ rhinestones, we get out our ever popular “Loctite® Super Glue Gel control” glue bottles. “Gorilla Glue” is another option. But please don’t use those slow-drying glues. We need instant bonding of rhinestones at our shop. We have no time for waiting for a glue to ‘set up’. I have read discussions about the time for E6000 glue -used by many studios, I know. What did I learn? “E6000 starts getting tacky in approximately 2 minutes and begins setting in approximately 10 minutes. A full cure takes between 24 and 72 hours. Remember, temperature and humidity will affect dry time. To speed drying, apply heat using a handheld dryer set on low.” We don’t have time for this, should you? We love ‘instant’! For added ‘texture’ with your rhinestone design, different colors, different sizes and shapes of rhinestones can be incorporated into a rhinestone design. Still use standard stones, for keeping your costs down, but yes, incorporate larger, Jewel Cut Flat Back stones with your basic smaller classic size #20 rhinestones for adding ‘depth’. Be sure and calculate how many to use, taking advantage of ‘package pricing’. For example, if the stones come in a 1-gross package, use nearly a gross in your design, not just a dozen or two for more economical pricing. This is another reason for using standard stone colors. You will find more projects for using a Siam stone, for instance, than for Siam AB, which doesn’t maintain a true red. Rhinestones Unlimited has a beautiful showroom. It’s a fabulous company to visit (with an appointment) to get an eyeful of just what is available to you, in the glittering rhinestone world! With wholesale programs, options for buying by your individual dancers and even workshops, check out Rhinestones Unlimited! Jewelry, specialty rhinestones, several embroidered appliques sold with or without rhinestones already attached (in many colors) this source for glitz is a not-to-miss company. So go ahead and plan on glitzing up your dance costumes. I hope I’ve provided some additional information to give you more confidence to get the job done! And if you are still in need of new or refurbished costumes for this season, check out our full custom design options on our website or faster and less expensive customizable costume options in our Web Store. 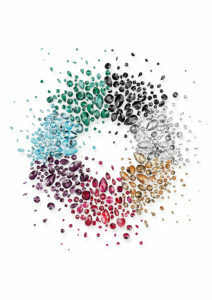 When it comes to Swarovski’s innovations, our clients have always been among our biggest sources of inspiration. This season’s innovations express the desire for uniqueness. Under the motto “Be Yourself,” we have translated this desire into crystal innovations reflecting four aspects of self-discovery: “Check Yourself,” “Find Yourself,” “Excess Yourself,” and “Dress Yourself”. We now invite you to explore them with us. Check Yourself: Vintage crystal and pearl designs are created in modern settings for a younger consumer. Classics are pushed further by playing with the scale of patterns of checks and tweeds. Dress Yourself: Extravagant designs in handcrafted metals embellished with crystals and pearls emerge as a key direction, highlighting the appreciation of a more sophisticated craft feel. Excess Yourself: An extreme exaggeration of forms and layering with a focus on the oversized for standout individual style statements. Find Yourself: With mass-produced goods being created at the expense of the environment, a slowdown ethic will result in a focus on heritage and authentic elements. Introducing NEW Crystal LacquerPRO DeLite! Crystal LacquerPRO DeLite’s five new colors are a beautiful reminder to slow the pace, enjoy Mother Earth’s bounty, and live sustainably. Combine them with color-matching Shimmer or Shiny LacquerPRO effects in designs for jewelry, watches, CRYSTAL LACQUERPRO DELITE FAMILY Shapes apparel and accessories – the subtly highlighted facets will give luxurious depth and opaque sparkle. When it comes to crystal assortments, we’ve always offered the most comprehensive range of colors, effects and articles in the industry; but we’ve now come up with a simplification that will make a big difference to the everyday lives of our customers. Core Assortment focuses on the 7 most requested colors: Aquamarine, Amethyst, Emerald, Jet, Light Colorado Topaz, Scarlet, and clear Crystal.